Adage Corporation, a trailblazer in user-centered design and service design and one of the best in Finland, is uniting with Eficode Ltd, the leading Devops-operator and pioneer of automated software development in the Nordic countries. 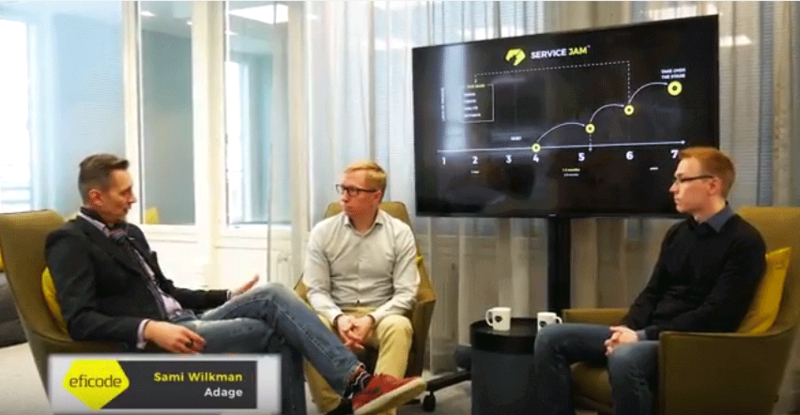 Adage Corporation, a trailblazer in user-centered design and service design and one of the best in Finland, is uniting with Eficode Ltd, the leading Devops-operator and pioneer of automated software development in the Nordic countries. Eficode is purchasing Adage’s entire capital stock in the corporate acquisition. The result is a company that is focused on customers’ digital needs and has unique expertise in service design, software development, analytics, and automation. After the acquisition Eficode will employ over 190 experts who are building the future of software development in Finland and internationally. Voit lukea tiedotteen suomeksi täältä. Eficode has acquired the entire capital stock of Adage. Adage will become a part of Eficode, and all Adage employees will go on to work for Eficode. Adage’s turnover for 2016 was 2.6 million euros. The people who owned Adage will become part-owners at Eficode in the acquisition. CEO of Adage Sami Wilkman will become head of Eficode’s digital business operations. The purchase price is not public information. “We have seen a change in the competition situation for our customers both in Finland and abroad, and we want to continue providing services that enable implementing and measuring the benefits of digitalization in a more concrete manner. Our services help customers reach a competitive advantage that crystallizes customer centric approach and automation combined with implementation and analytics. The deal is significant for both companies, and it creates a basis to evolve into the leading operator from the idea to automate production as business operations digitalize. Eficode’s vision is building software development of the future, and this deal supports implementing that”, states Risto Virkkala, CEO of Eficode. “For Adage this is a natural change. Previously we have been successful in combining design and research with excellent user experience. Now we can continue our design work with world-class products and services and at the same time ensure that the quality of their implementation is equally high. With Eficode’s expertise we can ensure our customers a whole package where the goals and requirements of business are refined into customer-friendly products and services”, says Sami Wilkman, CEO of Adage. The companies combined employ over 190 experts in Helsinki, Tampere, Stockholm, Copenhagen, and Beijing. For the time being Adage will keep its own name and business operations will continue uninterrupted. After the acquisition the companies are aiming for a turnover of over 20 million euros.